Arena México is one of the most famous wrestling arenas in the world. Located in Mexico City, it's the heart of the CMLL promotion. Wrestling cards are held every Friday, and boxing events are also held in the arena. 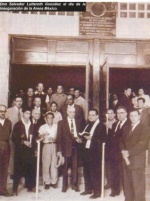 The original Arena Mexico opened on September 21st, 1933, which is taken as the start date for the EMLL promotion. 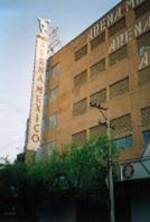 The current Arena Mexico building was opened on April 27, 1956. EMLL built this arena after the overflow crowd for the Black Shadow & El Santo mask match in Arena Coliseo. Arena Mexico currently holds 16,800 fans for lucha libre shows. Originally, the building held 17,678 people. The Rayo de Jalisco Jr. & Cien Caras mask match is believed to have been seen by an overflow standing room crowd of over 20,000 fans, causing structural damage to the building. The damage caused areas of seats to be closed for many years. CMLL has taken out more seats as their entrance set has become more elaborate. The arena celbrated its 56th anniversarry on April 27, 2012. The address for Arena Mexico is 189 Calle Dr. Lavista, Col. Doctores, Mexico City, 06720. And the telephone number is 55/5588-0385. This page was last edited on 6 December 2015, at 22:56.